Coupons are a fantastic way to save big money on your grocery bill. If you coupon correctly and diligently, you can easily cut your bill by as much as 50%. For some families, this can be their saving grace. However, if you’re not careful, coupons can actually cause you to waste money and I don’t mean chump change. Couponing can easily become not only a habit, but an adrenaline “high” for a lot of people. It becomes a game to see just how many deals you can score, how much you can save and just how many cheap tubes of toothpaste you can pick up in a month. The thing is though, each one of those items, free ones included, cost you money in some way, shape or form. 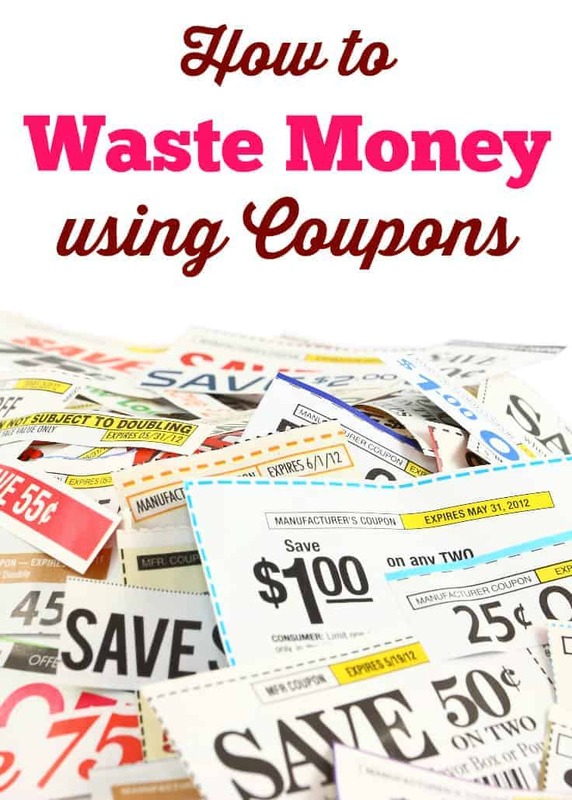 Let’s take a look at how you can waste money using coupons. How many times have you gone to the store with your coupon binder or coupon box and saw a clearance item that you had a coupon for and picked up a few of those items? If you’re like most coupon users, I’m willing to bet that the answer is quite a few times. How many of those items did you need right then and there? Probably very few. Instead, the items probably sat in your pantry for a bit where they were either used finally, donated or even trashed because they were no longer any good. If your item falls into the last 2 uses, you wasted money. How about the times you have bought an item just for the sake of using the coupon? This happens quite often and I’m also guilty of doing it. Sometimes, the item is something that no one will use! Why would you buy something that no one in your family will use? The coupon doesn’t make your family magically like that particular food or brand of shampoo. Instead, save the money and wait for another deal on your favourites. How about when you’ve seen an item you do use on sale, but you buy more than what your family can reasonably use? If you have a family of three that doesn’t like ketchup, it’s highly unlikely that you’re going to use 15 bottles before they all expire. Instead, pick up 3-4 and keep the rest of the money in your pocket. When you’re using coupons, you need to be absolutely certain of a few things One, that your family will use the item you’re buying. Two, that they’ll use the amount you’re buying. Three, that you’re not just buying it because there is a coupon for it. Otherwise, you’re just wasting money. Remind yourself that you don’t need to use every single coupon before it expires. Coupons cycle in and out each year. It’s totally fine to not grab every single deal. There will always be another deal and there will always be another coupon. Have you ever wasted money couponing? I can see by reading this that i am guilty of wasting money using coupons!! I don’t like seeing my coupons go unused, but then again, I only hang on to coupons that I actually have use for. I try to only clip coupons for things I will use. That being said, I received a “Free Dessert” coupon for my birthday from Boston Pizza. I took my granddaughter and mother with me. My mom only got tea, I had soft tacos and a tea, and my granddaughter had the kids meal. I paid around $30.00 with tax and tip, so realized my “free dessert” really caused me to spend money I hadn’t planned to spend. I don’t use coupons to much, I find I spend more money when couponing!! Unfortunately I have wasted money using coupons before, by buying more than my family can use. I’ve had to throw some things away. I’m getting much better at it now though, and only buy what we can use in time. Thanks for the great post. I don’t coupon as much anymore because I found that I was wasting money. If it is a coupon for a product that we use I will use it but I am more careful how I use them now. I’m guilty of this sometimes, too…. buy two and bogo deals tend to get me, and then I have the second thing hanging around the house for ages and ages. I seldom use coupons, there’s only me and I know what I like and need, so it’s seldom an advantage for me to use a coupon. I find I throw a lot of them out because they’ve expired as I hadn’t needed them. I see people make this mistake all the time. I understand having a “stockpile” of items that your family uses that are non-perishables, but if you’re a family of three do you really need 20 mustards? People need to realize that sales go in cycles, and they only need enough to get them to the next cycle. Great tips. I try not to buy items my family won’t use. If I see something free or nearly free though I will grab as many as I can and donate them.